"It was really hard reliving it and I try really hard not to do that, but if it can help in any way, it makes it worth while," Brooke says. The plot's certainly timely with more than half of the 60 murders in London this year being stabbings.And, according to the Office for National Statistics (ONS), knife crime rose by 22% in England and Wales in 2017.After her brother died, Brooke set up the Ben Kinsella Trust.She says it's heartbreaking that ten years on, so many people are still being killed by knife crime. "We've worked so hard to try to make a difference and every day I am picking up the newspaper and reading somebody else has lost a brother or a son and it can make you want to give up. 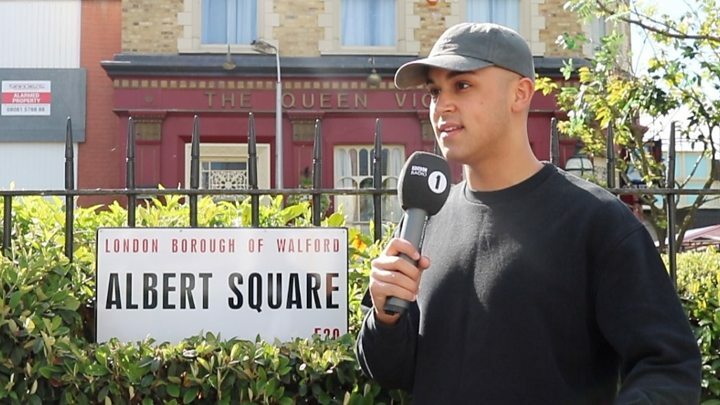 "This week viewers saw two of the characters, Keegan and Shakil, attacked by a gang.Spoiler alert - this article reveals plot details.Newsbeat spent time on the Albert Square set talking to the actors involved about how they prepared for the storyline.Shakil and Keegan were attacked after Keegan stole a bike from a well-known gang.He tries to smooth things over by giving it back, but he gets stabbed and dies from his injuries. 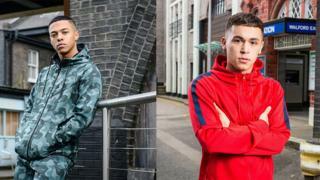 In the soap Shakil is 17 and Keegan is 16.Shaheen Jafargholi, who plays Shakil, told Newsbeat he felt under pressure to get the storyline right and to show what people in that age group are going through. "It's been intense, to make sure the story is accurate and it's delivered in a way that is close to the bone," he says.As part of his research, he spoke to a surgeon who deals with stab victims. "He told me about what happens to your body after you get stabbed and how you would react." Key to the story is showing the effects the crime has on all those connected to the victim.Shakil's mum, Carmel, played by Bonnie Langford, spoke to Brooke to help her prepare for the scenes.Brooke says: "In all honestly I don't want you to see what me and my family goes through and experience that pain. "But it is sadly the reality for us and so many others - maybe seeing that side of things people can understand it can happen to anyone. "Bonnie believes EastEnders hasn't shied away from showing that reality. "When we see things on the news, about tragedies you see the families and they're always at a press call or on TV. "What we can do is show what happens when the doors close and the ripple effect it has on all those people from a private perspective, it's so raw." Bonnie says she had to delve into dark places to play a mum who has lost her son. "They haven't been frightened to show the uncomfortable side and the harsh side and the nasty side," says Bonnie.She says when people are grieving, "things are said that aren't nice, but that's what happens, it's real".Follow Newsbeat on Instagram, Facebook and Twitter. Listen to Newsbeat live at 12:45 and 17:45 every weekday on BBC Radio 1 and 1Xtra - if you miss us you can listen back here.